We offer permanent, natural looking dentures, using a process commonly referred to as ‘all on 4’, to our patients in Leighton Buzzard, Milton Keynes and surrounding villages. What are ‘all on four’ implants? All on 4 implants give you beautiful, natural looking teeth which also function like natural teeth. The all on four process secures your denture to surgically placed dental implants so that you can eat, speak and live confidently without the fear of slipping dentures. What are the benefits of all on 4 implants? Many people are unhappy with conventional dentures as they can be prone to moving around in the mouth. In addition, a denture which initially fitted may, over time, become loose as a result of gum and bone shrinkage following the loss of teeth. This means regular visits to the dentist to adjust the fit of the dentures and may result in the need for replacement dentures in the longer term. All on 4 implants keep dentures securely and comfortably in place, allowing you to go about your daily life with confidence. With the all on 4 technique, your uniquely created denture is placed on top of 4 implants (or more if required) creating a permanent, fully functioning, highly realistic-looking set of teeth. Slurred speech and embarrassing clicks, whistling or clacking: All on 4 are just like natural teeth, so no more denture-related noises! Gum and mouth irritation, or pain caused by ill-fitting dentures: All gone with all on 4! During this initial consultation and planning phase, our qualified dental implant specialist, Neil Du Preez, assesses your suitability for the all on 4 dental implant treatment. This includes taking X-rays, or sometimes a scan, to assess the condition of your jaw bone and to plan for the procedure. This is when Neil places your implants. Whilst the procedure is commonly referred to as “all on 4”, Neil may occasionally use additional implants if he feels this is likely to give you a better and safer outcome. You are consulted at every stage to make sure you understand fully what is involved. Your custom made, permanent dentures, consisting of a titanium base, are then manufactured to your exact specification by a specialist laboratory. 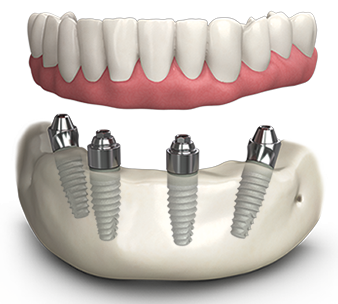 You can wear your existing denture while your implants are healing and integrating with your natural bone. Sometimes we can temporarily fix your existing denture to the implants. 4 to 6 months later your permanent dentures are fitted onto your implants. The reason for the waiting time is to give the implants time to heal and to fully and securely integrate with your jaw bone. Is there an age limit to have all on 4 dentures fitted ? Just as for a single implant, there’s no real age limit for all on 4 implants. Some of Neil’s patients have had all on 4 implants successfully fitted in their 80s! Instead, suitability for all on 4 dental implants is assessed on the basis of your general state of health and the condition of your jaw bone. This is all reviewed with you during your initial consultation to ensure the best possible outcome. Is the procedure for all on 4 uncomfortable ? The implant procedure is carried out under a local anaesthetic. The after effects are similar to having a tooth extracted so you may feel some discomfort due to the normal healing process. However, this is easily managed by taking over the counter painkillers for 2 or 3 days after the implant procedure. How long does does it take ? The whole process, from the initial consultation to the fitting of your permanent denture, usually takes around 4 to 6 months. 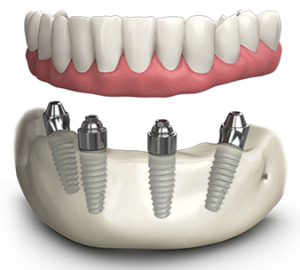 This is to allow time for the implants to integrate properly and form a solid base for your custom made dentures. Neil can fit you with a temporary denture during this period, either your own existing denture or a new set of temporary dentures. Can I have all on 4 dentures on only one jaw ? Whilst all on 4 denture can be fitted to both the upper and lower jaw, a permanent denture is more commonly suited to resolving problems in the lower jaw. We will only ever recommend what is necessary. So if, for example, your existing upper dentures or natural teeth are fine then we would only recommend fitting all on 4 dentures to the lower jaw, and vice-versa. What happens if one or more of the denture teeth gets damaged ? Your dentist can easily remove your permanent dentures for maintenance or repairs so you don’t need to worry. How do I clean all on 4 dentures? Can I remove them for cleaning ? As your all on 4 dentures are designed to be permanent, you care for them and clean them just as you would your natural teeth, without removing them. I’ve heard it can all be done in one visit. Is that true ? To some extent, yes. You can have all on 4 implants and a denture fitted (either your own existing denture or a temporary one) all in one day. However, the final result uses a titanium base which requires manufacturing time and custom fitting. We will also only fit your permanent denture once we are certain that the implant has fully integrated and is secure. This is why we tell our patients to allow 4 to 6 months for the whole process to be completed.